Ojibwa canoes opened up this continent. Ojibwa canoes opened up this country and looking back I've come to realize they expanded my life as well. Like kids today who take car travel for granted, my brothers and I just assumed that if we wanted to go from point A to point B in the summer that it would be by canoe. My grandparents were the only people I knew that still used birch bark canoes regularly. My parents had bought a red cedar strip canoe before I was born and it was the one they usually used for travel...until Kokum decided enough was enough, made a unilateral decision and taught my parents how to build their own birch bark canoe. Because of the danger when families traveled on the water, children were taught to sit quietly hour after hour. As a child my mother had survived a canoe accident in which she was the only survivor. She never learned to swim and demanded that as children we sit motionless and absolutely silent. In her experience children who chattered and fidgeted in a canoe caused trouble. I can tell you that it didn't matter how far to the front of the canoe you sat...her paddle could reach you if you fidgeted...and the bruises usually disappeared by week's end! We practiced mental gymnastics to pass the time. Ojibwa canoes taught endurance. One long day trip stands out in my mind. When we traveled, because I was the oldest I exercised my right to sit in the bow of the canoe. My brother sat behind me and we both knew enough to sit quietly and endure the boredom. We were returning from a visit to a relative and had left for home when the sun came up in the morning. We'd made occasional stops but for the most part had to just sit and sit.....and sit. 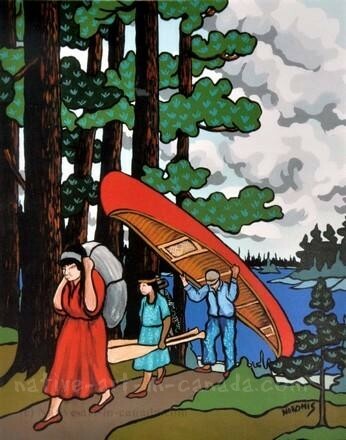 Ojibwa canoes taught us patience. Sometime late in the afternoon my brother slowly and discretely leaned over and pinched my bum! You may have made a big fuss over that but not me. I clenched my teeth and didn't let on anything had happened. My mother's secret weapon for controlling tattler's was to punish the tattler. Unfair. Mean. Abusive. But it worked. I knew if I said anything, even a whisper, that she'd make straight for the shore and paddle my bum just for making a fuss. So I shut my mouth. Then my brother leaned over slowly and discretely and did it again! He was in trouble. I was going to get even. Not at that minute, but he was going to get it. His life was in danger. He just didn't know it, yet. I sat with my hands on the gunwales, teeth clenched, every muscle in my body ready to spring. I could see our cabin in the distance and I was ready for battle. Now. . . your mother didn't condone fighting and neither did my mother. We weren't allowed to yell at one another, hit one another, or be disrespectful to one another. In her presence, anyway. But who cared? The kid was going to get his just desserts! As the canoe came up against the sandy bottom in front of our cabin I was out of it. I didn't care what my mother was going to do to me later, I was going to get even. I turned and in one swift motion pulled my brother off his seat and into the water. I pushed him down, straddled him and proceeded to punch the beejeebers out of him. He yelled. He screamed. His nose started to bleed. He called to Mom to help him. She beached the canoe, pulled it up on shore, hauled out the knapsack and cooking pot and walked towards the house. She'd known all along what was happening and because I'd not made a fuss, I got to dish out the punishment. I was so shocked that I stopped the beating. My brother just looked at her retreating back, got up and without saying a word shuffled off, sniveling into the house. I don't think he's pinched another woman's bum since then. I don't think I got away with hitting him ever again, either.